cameras are available to thoroughly explain treatments and help in patient understanding. We offer the strongest and most Aesthetic crowns to date. E-Max crowns are all ceramic which means they have no metal. They look a feel just like your natural teeth! With Invisalign, we are able to make minor cosmetic corrections by moving the teeth with out using braces. They are clear so no one can even tell you have them in. Such a great alternative to braces! Are you wanting to have a whiter smile the same day you leave our office? 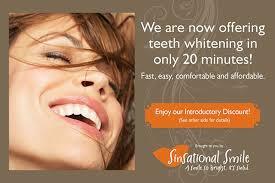 Sinsational Smiles Whitening takes just 20 minutes and you leave with whiter teeth the same day! If you are looking for a partial that is metal free, comfortable, light weight, and Aesthetically pleasing, a Valplast partial is the one! These partials are designed just for you! If you need to replace just one tooth or even multiple teeth, we can make a Valplast partial to fit around your existing teeth so you can have the smile you've always wanted!